Why create Glass free zones? As a practical act which creates areas free of surveillance or highly intrusive surveillance. As a symbolic act showing concern for privacy. As a way of exerting social pressure to establish norms around usage. As a way of exerting market pressure to discourage people from buying and companies developing these systems. Completely surveillance free zones which means areas where there is are no recording or surveillance devices at all. Highly Intrusive surveillance free zones which are areas which are free of – audio recording; Glass like devices and intrusive CCTV – but where there might still be some local CCTV recording for example a Bank or Bar where the owner will use CCTV footage if a crime is committed but normally the data is destroyed within a few days. The Cyborg Unplug device an anti wireless-surveillance system for the home and workplace. It detects and kicks selected devices known to pose a risk to personal privacy from your wireless network, breaking uploads and streams. Detected wireless devices currently include: wearable ‘spy’ cameras and microphones, Google Glass and Dropcam, small drones/copters and a variety of popular spy devices disguised as familiar objects. Anonymously sends emails (iOS) and alerts to smartphone app (Android). Free App. A visually impaired person may choose to use a wearable camera to assist them with navigation or reading for example this device which looks very like Glass of Lifelogger but which doesn’t require a connection to the internet and is not a recording or datamining device. Someone with Autism may choose to use a digital assistant that provides real-time assistance with reading faces during conversations. Someone with memory problems may choose to use a device which assists their memory. We ask that if you do ban Google Glass and similar devices from your property that you also respect the rights of such people and do not prevent them from using assistive devices where data/device remains within the control of the individual. The issue as we have pointed out elsewhere is not the device itself but rather ownership, control and mutual respect. We need to ensure that people can fully control their own body including any technological parts and be assured that they are not acting against their wishes or interests. We therefore urge the designers of devices to ensure that the needs of all people are taken into account and that the device itself and all data gathered by these devices are within the control of the individual and that unencrypted data is not stored or processed in the cloud. We would also press for a legal right to control your extended body including rights over all and any data gathered. The ban sign is free for non commercial use so feel free to print your own stuff but if you want to support us or don’t have a good quality color printer. 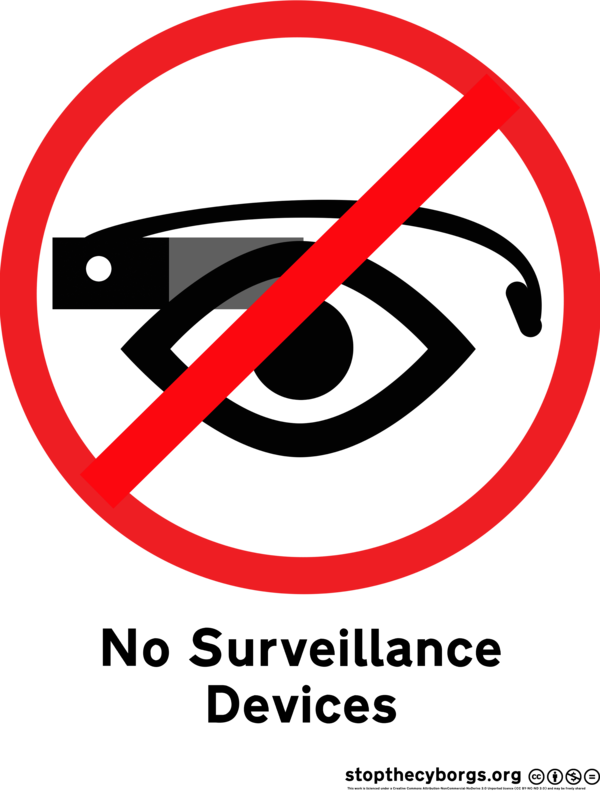 You can now buy postcard sized Google glass ban signs ($2.30) , small (3” x 4”) Stop the Cyborgs stickers($2.30) and t-shirts($22.50) from our store.